Good, faithful Seaman! One of the true heroes of the expedition. 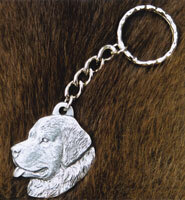 Remember Lewis’ Newfoundlander with this handsome pewter keychain. Seaman’s name is engraved on the back. Limited supply. REDUCED PRICE!